My job title is Business Development Officer, I am new in post with Unify but I’ve been a member of a credit union for over 20 years. Can you explain what your role entails on a day to day basis and anything you are currently working on? Difficult to say for certain what a normal day will look like as I haven’t developed a routine yet but I imagine for the most part I’ll be out and about in the community. My role is to increase membership and awareness of the credit union across the area we cover which is Wigan, Leigh, Chorley and Leyland. Credit Unions are the best kept secret in the financial world; whenever I explain to someone what a credit union is they say ‘Why did I not know about this?’ They’re literally blown away by the simplicity of a savings cooperative, owned by its members, run for the benefit of its members. So I’ll be going out and spreading the message to anyone who’ll listen. A really good day would be a visit to a school to do some financial education and talk to the children about savings and what the credit union does. Then on to meet the Finance Officer of a large employer to explain the benefits of offering payroll savings to employees. I may give a talk to a community group as we get lots of requests to do these and then catch up on my emails and paperwork. Why did you want to work for a credit union? I love working for the credit union because I believe very strongly in what they do. They are democratic, all the members are equal, there are no fat-cats being paid huge dividends, they really help people in a tangible way; even people who have previously had financial problems can join a credit union and by creating a good savings habit over time can begin to repair their credit history. If you could do someone else’s job for a day what job would do? If I could be anyone for the day I think I’d like to be a radio presenter so that I could just talk all day and play my favourite music and I’d never have to listen to music I don’t like and I could tell all my listeners to join the credit union. How do you like to unwind after a long week at work? I like to unwind by getting out into the countryside or to the beach with my family and our little dog, a favourite is Crosby beach which has the famous Anthony Gormley artwork ‘Another Place’, standing on the beach looking at all the statues disappearing into the water is really evocative. What is your biggest achievement to date, personal or professional? The achievement I most proud of professionally is that I helped to prevent a high-cost lender from opening up on a really deprived estate, alongside local councillors, church and community leaders we persuaded the landlord not to let the lender have a lease on the shop. I think that will have saved many people in that area from getting trapped into loans that they’d struggle to pay back. We also managed to get a local credit union to open an office in the community centre a couple of days a week so it was a win all round. If you ever see Julia out in the community promoting our credit union, feel free to introduce yourself and share your stories and experiences with us, to her! 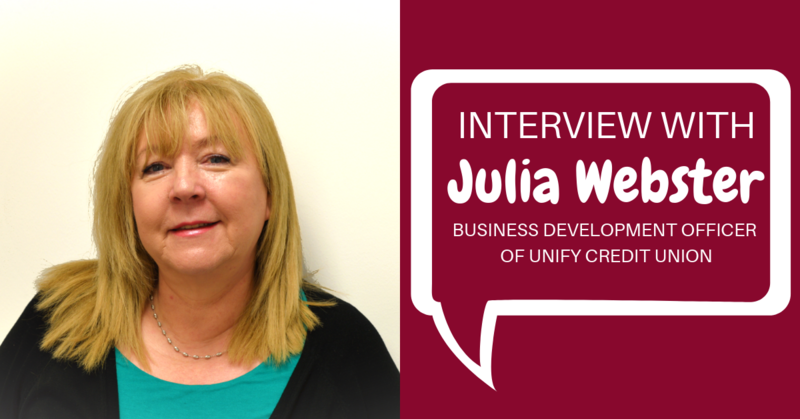 If you're an employer, get in contact with Julia to find out more about becoming a Workplace Partner. Next Post: Your Credit Union Will Save You Money! If you need a loan with Unify Credit Union, click here to find out more.